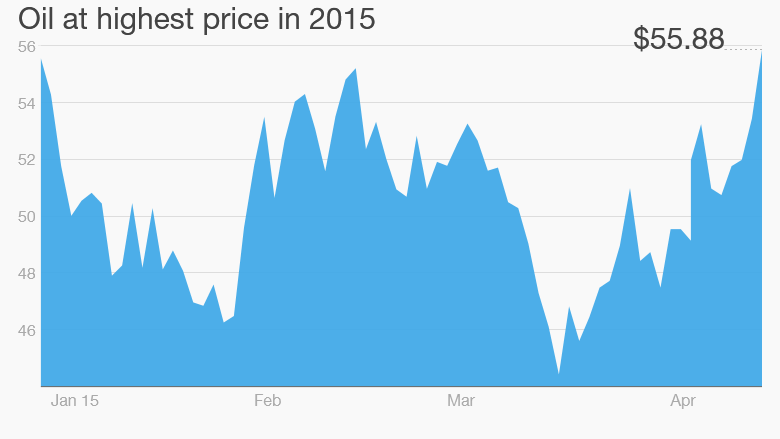 Oil peaked above $56 for the first time in 2015 on Wednesday. 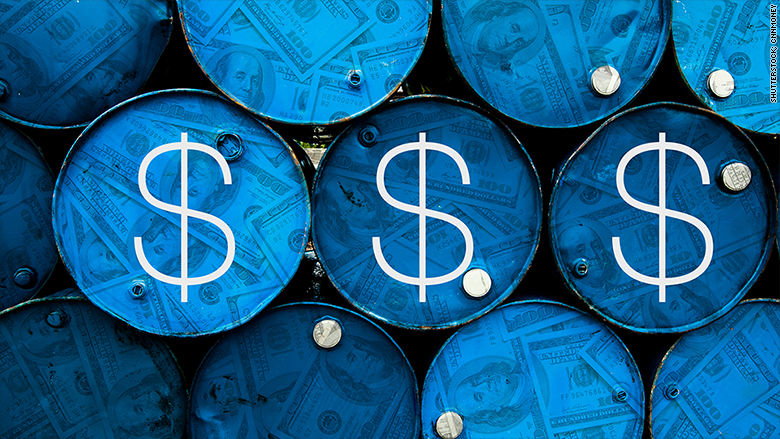 It's the fifth straight day the price for a barrel of oil has nudged up. Investors are cheering and buying energy stocks while American drivers are cringing at the prospect of higher costs at the pump. Consumers have loved low gas prices this year. The average gallon of gas costs a mere $2.39. That's way below the average a year ago, $3.63, according to AAA, although it's off the rock bottom levels of $2 a gallon that many Americans saw around the New Year. So are the super cheap oil and gas days over? Some are beginning to ask, although calling the bottom (or top) of the oil market is even harder than calling the stock market. "Right now, oil is on the verge of breaking above a crucial near term resistance level that could spark a $6 to $10 rally into the mid to high $60s," wrote Timothy Anderson, managing director of MND Partners, in a morning note. Investors are feeling optimistic enough to jump back into energy stocks. Range Resources (RRC) stock is up nearly 6% Wednesday and offshore drilling company Transocean (RIG) is spiking 9%. Exxon (XOM)'s stock is 2% higher Wednesday and enjoying a 4% bounce in the past five days. Royal Dutch Shell (RDSA) is up 1.7% Wednesday, and so are Chevron (CVX) (1.5%) and ConocoPhillips (COP)(1.4%). Energy stocks have been by far and away the best performing sector on Tuesday and Wednesday, helping to lift the overall market to gains. But remember that many of those companies' shares are down double digits (in percent terms) from a year ago. While many believe prices will go back up, there's a lot of doubt about whether they'll be back at $100 a barrel any time soon. "We believe that it is too early for investors to buy oil," wrote Paul Christopher, head of international strategy for Wells Fargo. "We see in these currents a market still trying to find a balance." Why the sudden price rise? Oil has slumped because of a global energy over supply. OPEC, led by Saudi Arabia, has been vocal that it will not cut production. It increased production yet again in March. America is on track to produce a record level of oil in 2015 -- even more than in 1970. Furthermore, the U.S. Energy Department projects that America could be energy independent -- exporting more than it imports -- by 2019. The main driver of the recent uptick in oil prices appears to be a report from the U.S. Energy Information Administration showing that supplies in America didn't grow much last week. It's another small signal that production could at least be leveling off, although there are many factors that could change that, including allowing Iran to export more oil if the nuclear deal goes through. Another key is that global demand for oil may be picking up, especially as Europe's economy looks healthier than previously thought.